This lesson explores the primary influences, or drivers, on water temperature of inland streams and rivers. We use a simulated flight, or flyover, where we look down at the features of the South Boise River in Idaho. An unregulated as well as a regulated reach of the river are explored (above and below the Anderson Ranch Reservoir), with a look at cross sections of the river and its environment at key locations during the flyover. We explore how environmental factors (climate, geography, stream morphology) impact water temperatures. Then, after defining the factors that affect water temperature, we identify which factors are most important for water temperature change due to climate. Good material in the lesson, but I didn't think the quiz stuck all that well with the lesson. it was very linked with my studies. I found this sites very useful and effective for me. this is apart of our future of the planet. This was the best quiz ever, i learn a lot from this lesson, i felt like am already doing my career, its so interesting. its co-interlink with my course, and i enjoyed it. just wish i could get more of such lessons in my career. Information on thermal interactions in streambeds/inland water bodies was broad and semi-informative with heavy doses of global warming projection. A good overview of how important temperature is in river regimes. Gather available data and establish a conceptual model that identifies which “heat load” parameters will drive water temperature for inland streams. Assess the importance of different “heat load” parameters in unregulated stream reaches, a reservoir, and regulated stream reaches. Differentiate the influences of non-advective parameters (radiation exchange, air temperature, friction, etc.) and advective parameters (groundwater, runoff, in-channel flow). Describe temperature distribution in deep reservoirs and how this can be used for water temperature control. Summarize what current studies identify as the main drivers of a stream’s heat budget. Summarize what current studies identify as the main drivers in recent warming trends of stream and lakes. Explain the relationship between streamflow discharge and water temperature. Explain how water temperature increases may be diminished in a warming climate. 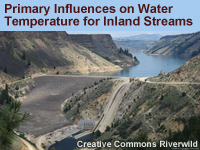 water temperature, water temperature drivers, streamflow, discharge, floodplain, climate, climate change, water resources, International Panel on Climate Change (IPCC), South Boise River, watershed, basin, Anderson Ranch Dam, Anderson Ranch Reservoir, reservoir, riparian, alluvial, alluvial aquifer, unregulated stream, regulated stream, streambed, dam, spillway, normal pool, inactive pool, dead pool, snowmelt runoff, snowpack, runoff, shortwave radiation, longwave radiation, sensible heat, latent heat, evaporative cooling, frictional warming, conduction, heat load, advective, non-advective, groundwater, hyporheic flow, phreatic flow, baseflow, channel bathymetry, thermal stratification, drought, channelization.